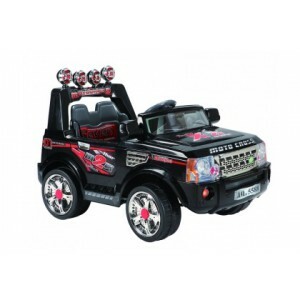 This kids 12v Range Rover Sport Style Ride-on Jeep is powered by 2X6V 35 Watt motors so it will be easy to drive on any grassy areas or rough surfaces. 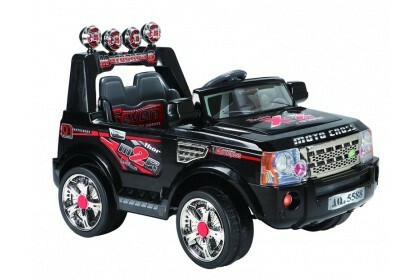 This childrens ride-on jeep boasts many great features such as a steering wheel with working horn and music, there is also a siren and light sequence on the rear roll bar of the jeep. This feature can be turned on and off by a push switch on the bar itself. The charging point for this 12v Land Rover Range Rover Sport Style Jeep is neatly positioned like a real car behind a fuel filler type cap, protecting the electrical socket while also looking mega cool! As you are buying the very latest model it is made to impress and at this unbeatably low price you and the lucky owner will be very satisfied with its power, off road ability and its many amazing features.